1. COMMON SENSE a commodity we all possess, but may sometimes forget to use. Don’t play “cowboys” and speed everywhere. Specifically do not roar into hill tribe villages, disrupting the quiet village life. Go in as quietly as possible, even turn off the engine and coast in if you can. 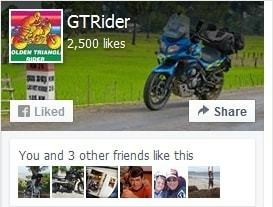 See the Thailand Riding Tips page. Go into hill tribe villages quietly. 2. HELMET WITH VISOR this is a safety device designed to protect that object attached to your neck. Helmets are compulsory; although enforcement is somewhat lenient. Despite this don’t go riding up-country without one: you’ve only got one head, look after it. Use a visor on your helmet, this protects your face from windburn, dust, stones and those thousands of insects that delight in flying around at night, especially at dusk. Motorcyclists who care should bring their own helmets with them. Rental helmets are never as safe as or as comfortable as your own! Your own helmet is best – bring it! A good helmet is recommended to make sure you enjoy your holiday with enough safety. 3. CLOTHING generally 3 or 4 changes of clothes are sufficient. Plan to spend 2 nights in a town every 4 or 5 days to do laundry; if you run short, jeans & T-shirts are cheap and readily available in Thailand – buy them as you go? Don’t ride with sleeveless shirts, shorts and thongs on; but wear a long sleeved riding jacket, long trousers and good shoes / boots. These protect you against wind and sunburn, insect stings, stones and other debris thrown up off the road, not to mention the road itself, should you make a sudden close encounter of the asphalt / gravel kind. Remember, you’re on holidays and want to enjoy them, so look after yourself. Enjoy your holidays – wear the right gear to protect yourself. Gloves are recommended for the same reasons; the automatic reaction when you fall off is to put out your hands to cushion your fall. Wear a good pair of gloves to protect you from road rash, stones & insect bites. Riding pants – either moto-cross style or mesh pants are recommended, not jeans. These usually have some built in protection, plus don’t show the dirt as much &; so stay clean longer. You only need one pair, rather than 2 (or 3) pair of grubby jeans for riding. If you worry about the heat, then use vented mesh pants. Assero tropical pants are great for wearing in the heat of the tropics. Hot Season 1 mesh riding jacket, 2 pair jeans, 1 pair riding boots, 1 pair light weight gloves, T-shirts &; short sleeved shirts, shorts and sandals for night wear. Dust mask / scarf for dirt riders, from mid February – May. Mesh jackets are the way to go in the tropics. Sun block lotion (SPF 50+) is recommended if you burn easily. The tropical sun might be great for a tan, but it is even better for sunburn and possible sunstroke after a day’s ride in the hot sun. Cold Season 1 warm long sleeved riding jacket, 2 pair jeans, 1 pair riding boots, 1 pair warm gloves, 3 T-shirts, 2 long sleeved thermal undershirts, 1 jumper / jacket and shoes for night wear. Wet season light weight two piece rain gear is recommended. from mid May – November. Bring a light rain jacket in the cold season for extra riding warmth; it should be light & easy to pack. In Laos I carry a rain jacket until the end of February. If it is not raining the jacket can come in handy when it is extra cold. Riding in Laos note that the weather is more changeable than in North Thailand. It also gets colder & wetter. In January 2016 in Xam Neua & Phongsali, there was snow, rain & freezing temperatures in many places in some severe weather. The cold season can also run longer. Even in the south sometimes. In late February – early March I’ve ridden in cold rain from Pakxe north to Tha Khek. I always carry my rain jacket for this – one for the rain & two for the cold. 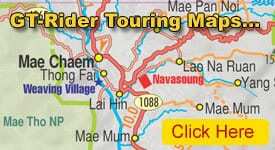 Laos – a road to ride – the Kasi short cut. Medical kit a small kit for grazes, cuts & burns is also a good idea. 4. CARRYING LUGGAGE travel light, use a small sports kit bag. All you need are 3 or 4 changes of clothes (see clothing). If you can’t get all your luggage in a small sports kit bag, then you’ve got too much! Either leave it at home or at your guesthouse in Chiang Mai. Travel light is the way to go. 5. DUSK is the most dangerous time of day to be riding. Be warned, at this time of day there’s a lot of roadside traffic traveling at different speeds, often drifting onto the road oblivious to other vehicles. Night riding is not recommended for two reasons; (1) it is dangerous and (2) you miss out on the scenery. 6. ACCOMMODATION good clean hot water accommodation is generally available every 80 kilometers. Except in the cold season, you probably don’t even need hot water in the warm tropical climate. Prices start at 150 baht for the real cheapies & go all the way up to 20,000 baht a night + for the real goodies. All you need is a clean, comfortable, secure place to sleep, & value for money guesthouses are everywhere. Aim for 400-800 baht a night & you’ll sleep well. A comfy resort room for the night @ 700 baht. 7. FOOD available everywhere. All towns have at least one good restaurant. Thai food is fantastic, and justifiably famous for its delicious hot and spicy taste. It is one of the real highlights of touring Thailand. If you’re in the right place, it’s always good and your biggest problem will be knowing what to order without an English language menu. Thai cooking never disappoints a hungry rider. In the bigger towns there is nearly always a popular pub / restaurant or a “suan aharn” garden restaurant, with a relaxed atmosphere, great food and frequently live music. These are often the best places to go for a night out, with good food and music. If you’re not sure where to go, just ride around town a little and see which restaurant has the most vehicles parked outside. Allow minimum 150 baht for a good breakfast, 140 baht for lunch and 300 baht for dinner and you will eat very well; or “go Thai”: to eat at street stalls or in the night markets & your food bill will be half again. Muslim riders need not worry too much, as Thailand has a not insignificant Muslim population, so that you can nearly always find a Muslim or vegetarian restaurant in the main towns. Malaysian riders don’t hesitate to come – if you think you might be stuck, just ask a motorcycle taxi to lead you to the local Muslim / vegetarian restaurant! 8. WATER available bottled in most towns. If you’re going off the beaten track and are concerned about not being able to obtain drinking water buy a couple of bottles to take with you. Otherwise soft drinks, Coke & Fanta are available everywhere. It is never a problem being able to find something bottled to drink. Bottled drinks range in price from 10 – 20 baht. Sponsor a yellow liquid in a small bottle. Marketed as an electrolyte drink, this is no ordinary electrolyte, and definitely gives you a buzz (high sugar and caffeine content?) If you’re feeling tired or suffering from the heat, try 2 bottles of Sponsor and a half bottle of water and you’ll pick up within 15 minutes. (We reckon the extra buzz increases your top speed by 10-15 kph!) When you are out on the road, riding in the heat, consider drinking a couple of bottles a day to keep alert and riding well. Cost 10 baht a bottle, available everywhere. M-Sport is another more healthy electrolyte type drink if you’d rather not O-D on Sponsor. Electrolyte powders in 5-8 baht sachets are also available at most pharmacies, and are recommended in the heat. Stunning Wat Chong Klang in Mae Hong Son. 9. MONEY don’t carry excessive cash and invite trouble. Keep enough money for each day in your wallet and the rest out of sight. Banks with money exchange and international credit card facilities are widespread in Thailand; most ATM cash dispensing machines will operate on your own bankcard pin number from home. Overseas ATM cards: if you’re using a non-Thai cad then try use an ATM machine directly outside a bank; because if the machine gobbles up your card it is easier to go into the bank to ask them to get it back for you, rather than being stuck at a machine on it’s own somewhere. In Thailand most stand alone ATM machines are looked after by security companies & you need to contact the bank HO to arrange a meeting with the security company to deliver your card back to the nearest bank branch. In Chiang Mai if you are looking to change cash money, the best place to go is SK Money Changer. Laos too has many ATM machines now, but they pay out in Lao Kip & it either does not last long or you have to carry wads of kip. In most places you can pay bills in Thai baht and US$ (in small denominations) – and get Lao kip for change. 10. TRADITIONAL THAI MASSAGE available in many up-country towns. These are excellent value and good for relaxing a tired body after the day’s ride. The recommended length of time for a massage is 2 hours; one hour is too short and three too long. The normal cost of a two-hour massage is 250 – 300 Thai baht. 11. ALCOHOL don’t drink and ride, especially in the daytime heat. Don’t waste time listening to drivelling alcoholic publicans, who never get further than their bar stool. You’ll find a few of these around. They can tell a good story, but need “jockey wheels” just to stand up half the time!